They are the perfect portable craft: she has a small container of the silk covered bases, that she makes ahead of time, and then some small, flat spools of ribbon (they come on a piece of cardboard). A needle, a pinch of beads. The whole kit & caboodle ends up being no bigger than my makeup case. My DIY’s tend to be a little larger. I’m on the hunt for a good, portable craft for the trip. Something to keep the creativity flowing. Knitting and I had a big fight when I was younger and crocheting and I aren’t on speaking terms either. What do you suggest? Tell me what you’ve been up to and include some links in the comments so I can be inspired! P.S. 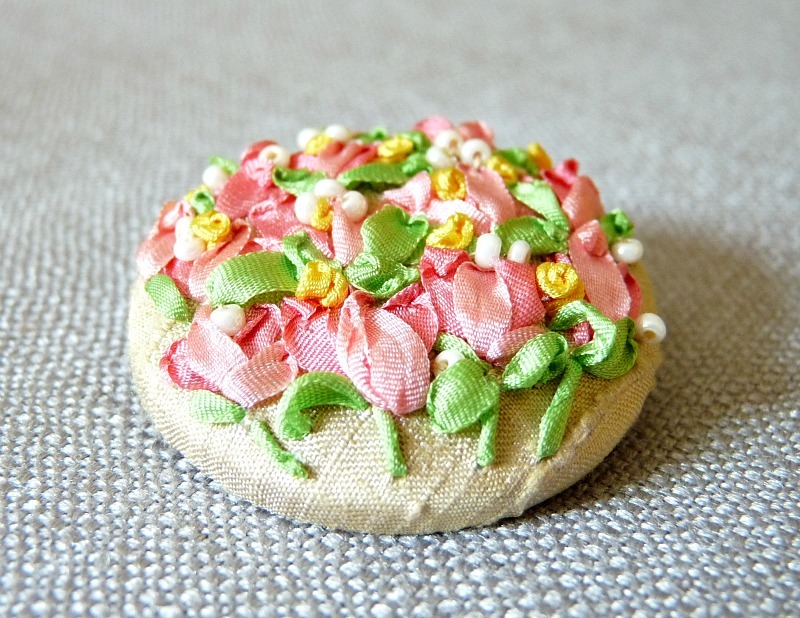 Yes, I plan to photograph a tutorial for these brooches. 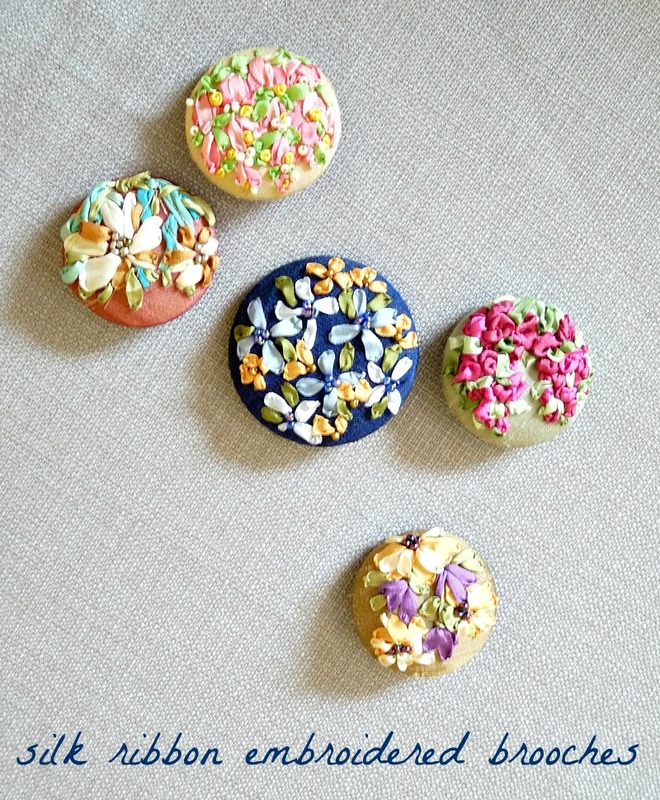 And, yes, these brooches (and new ones my Mom is making this fall) will be available for sale in the Etsy shop when we re-open. I just ran out of time to list these . . .
For my recent holiday I thought about cross stitching or embroidery. I didn't look into it thaaaat much but did learn that to avoid getting scissors confiscated on the plane you can use the sharp mini-blade in a thing of floss to cut embroidery threads. Oh, that is such a good tip to skip scissors! Awww, she'll be happy to hear that! She never sees her creations as beautiful.I'm similarly stumped. 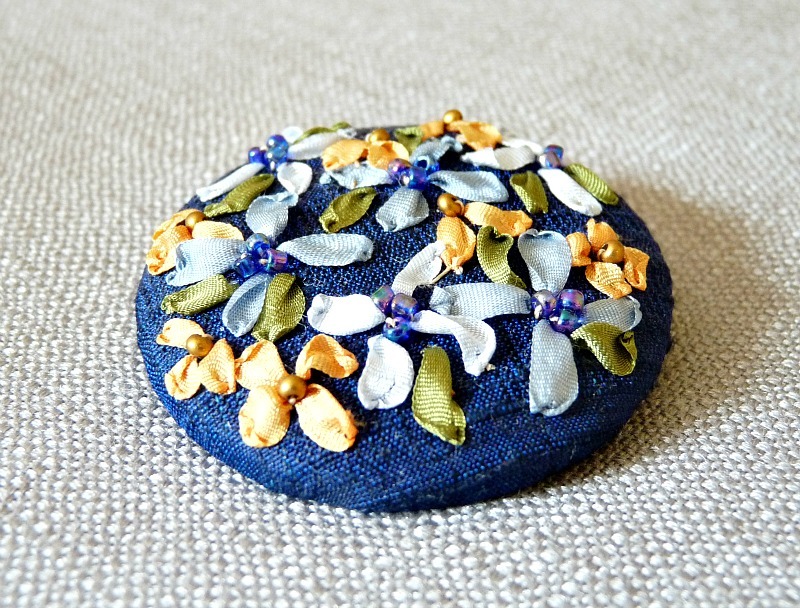 ALL is can think of embroidery . . .
Wow…these are really pretty and very detailed. Your mom is amazing Tanya! I'll be sure to pass on the compliment. She is definitely awesome in my eyes! I can't wait to re-open the shop and list some of her creations. She sews beautiful things too. You should send your unfinished projects to me so I can complete them, lol! Cross stitching sounds fun! I pinned a few cross-stitched cards that look cool and easy. Those brooches are beautiful! Not sure I can help with the portable craft though… good luck!! I'll be sure to pass along the compliment. Somewhere, my Mom is blushing! Don't worry – I'm stumped too! 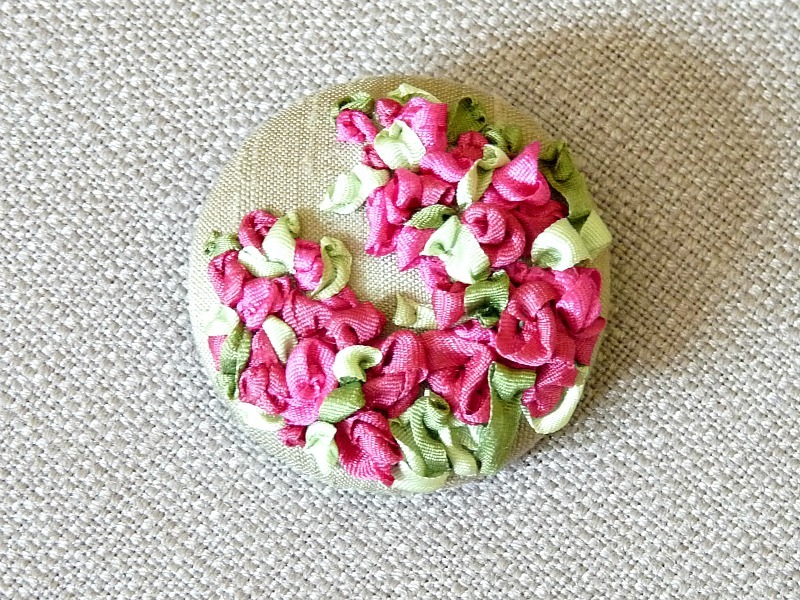 Beautiful brooches, I have a friend in mind who would just adore them. I might have to get her one. Sorry I don't have any ideas for you though! My Mom will be flattered by your kinds words! Hmm, what about beading? Making jewelry or some such. I've never done it, so I don't know if there is big stuff involved. Seems small though. Oh, or what about some kind of weaving or macramé sort of thing? You could probably stockpile a million and a half friendship bracelets (and I'm sure you'd find a way to make them super interesting). I'll. E curious to hear what you come up with as a portable craft. Good luck! Ooo, so many good ideas! I have made jewellery and didn't think about bringing those supplies because they are in a huge tackle box, but I could totally make a mini kit. And friendships bracelets! Aw, that brings back happy memories. Great ideas!! Your mom does such exquisite work. She's very talented. I see a lot of embroidery or jewelry projects in your future. I usually pull out a sketch book, intending to draw pretty pastoral scenes… and end up writing to do lists or the layout for the next reno project. Try knitting. You might like it better now that you've spent some time apart ;)By the way, saw your letter to the editor in the latest Style At Home! Kudos to you! Haha! Yes, I thought about drawing, but knew a pencil in hand would lead to me planning projects I will have to wait months to tackle. You can try paper piecing for a quilt top. Something like hexagons would be a good take with project and could look very modern with the right fabric choice. I Googled directions and came up with this http://chasingcottons.blogspot.com/2011/09/quilt-class-101-english-paper-piecing.html . If you check Pinterest there are a bunch. I was drawn to http://pinterest.com/pin/21462535694701079/ this one. It's modern but very feminine which I like. I couldn't resist another hexagon quilt image http://pinterest.com/pin/66217056991191400/ although this is just am image from Garnet Hill and doesn't include directions.You can also do yo-yo's for a quilt which is also hand work intensive. And you don't have to make a quilt. You can do a table runner, a throw, a wall hanging, etc. They are ALL gorgeous! Amazing attention to detail. The quilt is stunning . . . imagine the work . . . Thanks for the idea!! Its amazing and looking like very delicious cookies which makes me hungry. 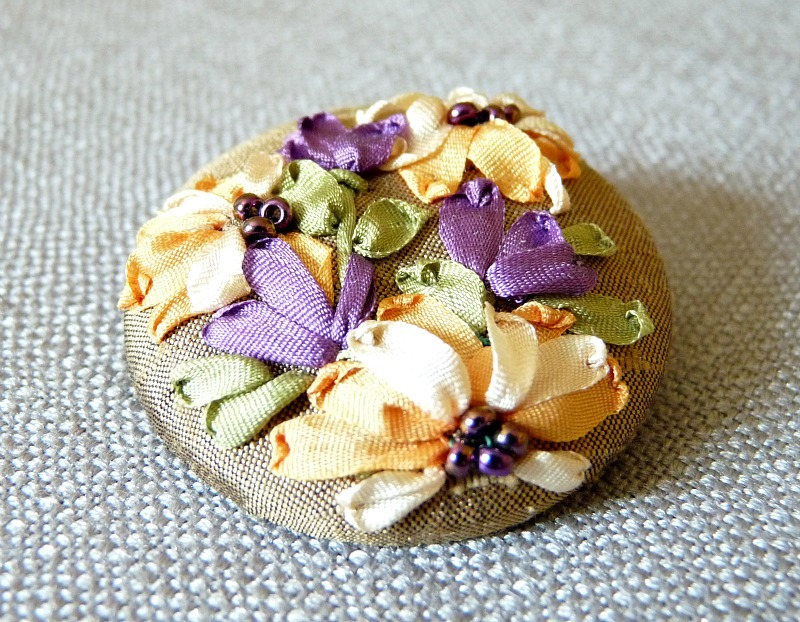 Creating such kind of brooches is a great fun and your mother is really a skillful lady.